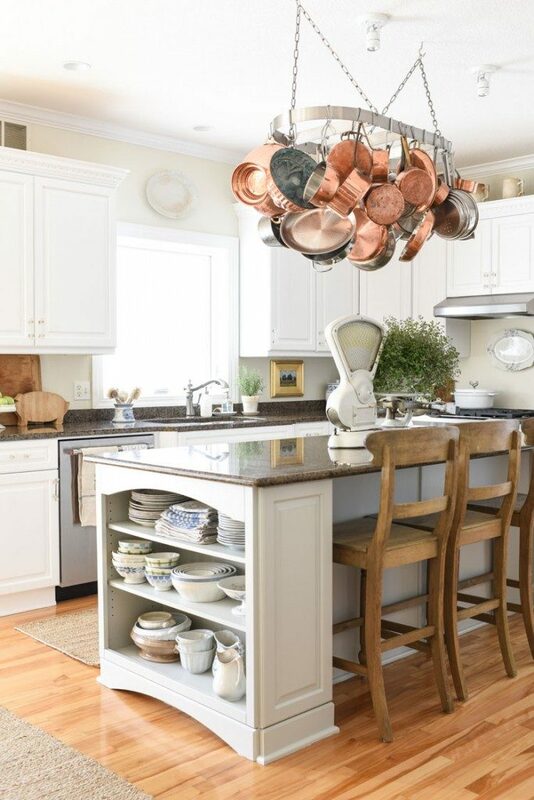 Miss Mustard Seed proves that paint, patience and a little bit of elbow grease can transform a kitchen. Rustic textures, white paint and antiques with plenty of patina combine for an airy farmhouse feel. There are some rooms that need a total overhaul, because they are dated, damaged or downright ugly. There are other rooms that need a makeover simply because they don’t reflect the personality and style of the family dwelling there. Such was the case with this kitchen. It had great bones, nice wood cabinets, upgraded counters and birch floors, but it needed an injection of charm and personality. And the most budget-friendly way to do that was paint. 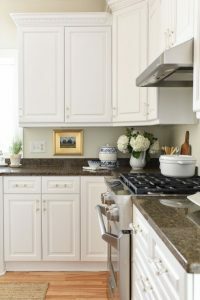 The cabinets were primed and given a fresh coat of a custom-mixed white paint, which immediately freshened up the kitchen and gave it more of a cottage vibe. Swapping out the traditional-style nickel hardware with some reproduction glass pulls further customized the cabinets. Can’t find the perfect color from the fan deck of paint swatches? Miss Mustard Seed recommends mixing a custom color that suits your space and your taste. Several shades of white, such as the creamy hue on the walls and a crisp color on the cabinets and trim, give the kitchen dimension. 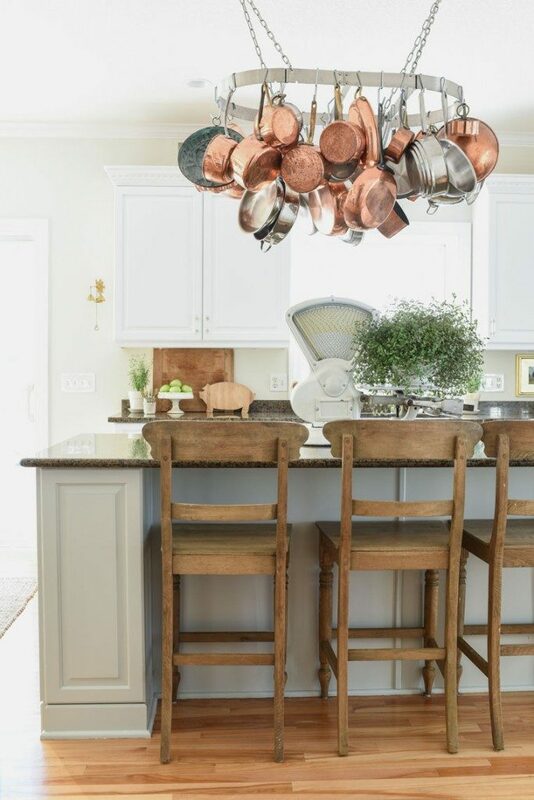 The entire look was finished off with antique accessories, like ironstone pitchers filled with wooden spoons, an old grocery scale and linen textiles. These were all relatively small changes that made a big difference in the overall look of this space. Painting built-in cabinetry is one of the most economical ways to update your kitchen, but it can also be an intimidating step into do-it-yourself territory for a novice. Understandable, because it’s a big project that involves dismantling the busiest room in the house. There is plenty of photographic evidence, though, that proves painting cabinets is worth the time and the effort. Those who are brand new to painting furniture and/or cabinetry should test the entire process from start to finish on one door. It’s a great exercise to learn what works and what doesn’t before diving into the entire project. This is also an important step when working with unfamiliar products. Paint the cabinets a section at a time. It’s easy to get carried away and remove all of those dated, builder-grade oak cabinet doors at one time, but having the entire kitchen ripped apart can add more pressure to the project. It can also cause an issue if space in the garage or work area is limited. You’d be amazed how much space cabinet doors can take up when they are laid out to dry! The project might take a little longer to complete, but there will be some semblance of order while the work is being carried out. Always take the time to properly prep and prime all surfaces. We want to get right to the fun stuff, right? Yes! But it’s not fun when the paint is bubbling up over greasy build-up or starts peeling just days after the cabinets are painted. Take the time to clean the cabinets with a grease cutting cleaner, sand them with 80-100 grit paper to rough up the surface, and prime them with a quality adhesion primer. Use quality paint and tools. The old adage, “You get what you pay for” definitely applies to paint! A quality paint will go on smoother, require fewer coats, will be more durable, and will level out to hide brush strokes and roller marks. It’s worth the splurge! While a paint sprayer isn’t a required tool, it makes the work go faster and the end result looks more professional. A project can be completed, though, with a well-made 2 ½” synthetic-bristled, angled sash brush and a small foam or microfiber roller made for painting trim. Give the cabinets time to cure properly before heavy use. It’s exciting to get those freshly-painted cabinet doors hung as soon as they are dry, and that can certainly be done, but be aware that almost all paints require 30 days to fully cure. During that time, the finish is more susceptible to gouges, scratches, and dings. Let your family know to treat the cabinets with care during that time or, if possible, just leave them to cure in an out-of-the-way place before putting them into daily use. 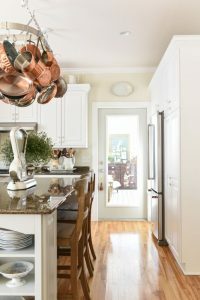 By putting some of these tips to use, your painted cabinets will look like they were done by a professional. Your wallet will definitely know the difference, though! For more information on painting kitchen cabinets (and many other things), visit missmustardseed.com.